From Salt Lake City to Cedar City, aka Seven! I got the photo I wanted! Does that mean I can go home now? For those of you who don’t know, choosing my route across the country was an arduous task. In fact, it continues to be an arduous task. There are so many things to see, and only so much time. Previous versions of my route included continuing up to Seattle, going through Yellowstone, sweeping down to the Grand Canyon, poking around New Orleans… pretty much I wanted to do it all. Some things just had to be saved for later trips. 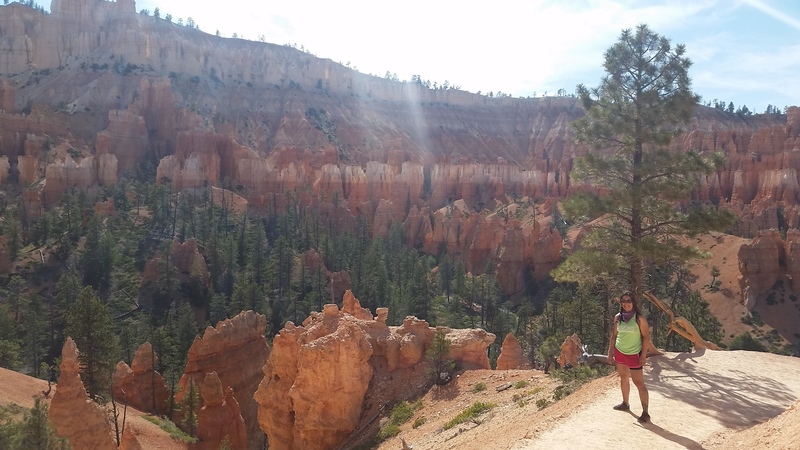 But there were two things that I refused to give up: Bryce Canyon and Zion National Parks. And so I continued heading south from Salt Lake City. I know, I know, a cross country trip from west to east doesn’t get accomplished by wiggling north and south. Whatever, I wanted to see southwestern Utah. 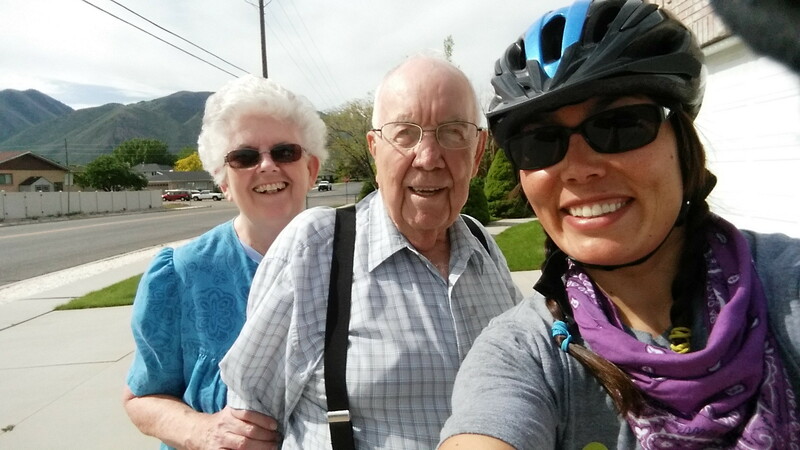 Kevin’s aunt and uncle, Pat and Ray, in Spanish Fork. So on Saturday May 30, after leaving my wonderful hosts in Salt Lake City, Lou and Julie, I headed to Spanish Fork to visit Kevin’s aunt and uncle, Ray and Pat. 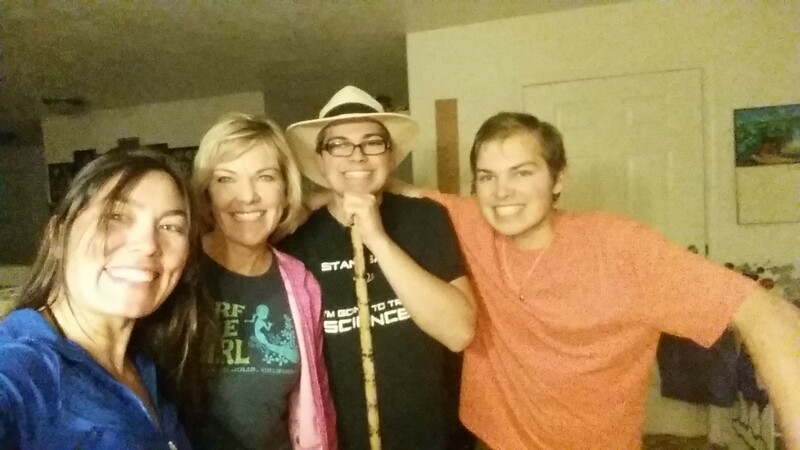 They treated me to a fantastic evening of ice cream and 8×10 photographs of Kevin and Sunyoung’s wedding in Korea. They had also spent some time in Thailand, so I got to flip through their photo albums as we shared our different experiences there. 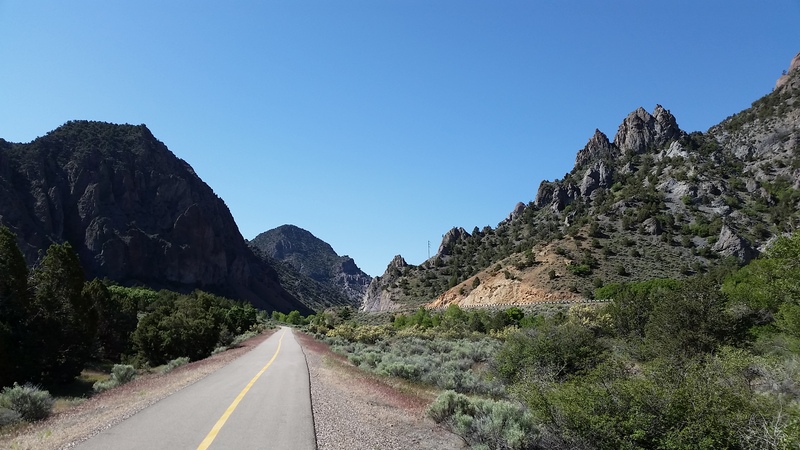 The ride to Spanish Fork was incredibly hot, though, and left me drained of energy. Of the three of us, I went to bed first. Honestly, night owl me? That’s impressive. Flats flats flats flats and more flats. Sunday was another hot and windy day. Ray pointed out to me that my route would take me past a bunch of windmills. He said, “They put those windmills there for a reason.” Sometimes the sight of windmills makes me happy, sometimes they make me miserable. It depends on which way their blades are spinning. I think the times they make me unhappy outnumber the times they make me happy by about twenty to one. Then I got delayed a bit more by yet another flat tire. All I saw was the tent. The tent means camping. I’ve gotten into the habit of trusting Google to tell me where there are campsites. I used to call ahead and verify, but what’s the point? The Google knows all. So I plug in “campground” and Google Maps shows me that little tent icon to tell me where to go. I saw a tent in Ephraim, and that’s where I went. Turns out it was a ranger station, which is really just an office building. It was already close to 9 o’clock, there were mere minutes left of daylight, and I just didn’t want to ride anymore. I pondered what to do and finally decided to go for it and set up my tent. There was a small patch of grass in the back with a picnic table. I figured if anyone saw me, they would assume I was a ranger testing out camping equipment. I understand the concept of summits, but I still think I end up on top of too many. About two minutes into setting up my tent, I heard someone say behind me, “It’s okay.” I straightened up and saw someone rolling in on his bicycle. He said it again as he got closer, slowly approaching. “It’s okay.” The way he said it made me suspect that he thought I was a lost puppy that he had to coax into trusting him. Turns out he’s a ranger based at that station. He advised that if I wanted to stealth camp, I should try to actually be stealthy and go among the trees. I don’t know, I think I kind of like the hiding-in-plain-sight strategy. Anyway, he said I could camp there, he just said it would be best if I was packed up and on my way early since there was a huge meeting happening there in the morning. We talked for a while, and I was highly amused when I walked with him into the office to use the bathroom and his bike made that familiar hiss I know so well. He glanced down and shrugged off his flat like it was the most natural thing in the world, but I had a hard time not busting out laughing. And indeed, early in the morning, this tiny ranger station was absolutely crawling with rangers. I had taken his advice, though, and was mostly packed up when they arrived, so as far as they knew I had only stopped there for a few minutes, maybe to change a flat. Many thanks to the kind ranger, he showed up in time to say goodbye to me as I was leaving – I won’t put his name here just in case he gets in trouble for not shooing me away. Monday I kept my eyes peeled for the place where Ray and Pat had gotten married in Manti. It was actually pretty difficult to miss. It’s the very large temple. 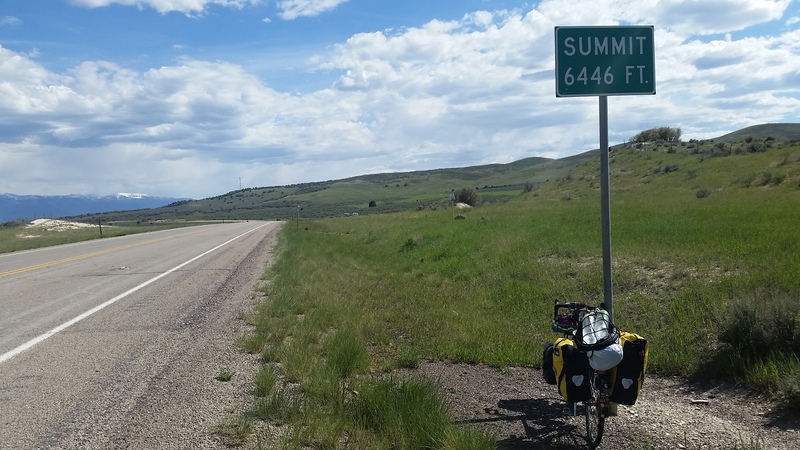 As I closed in on Salina, I saw something absolutely incredible coming from the other way – another touring cyclist! I hadn’t seen one in so long. He saw me and pulled over to my side of the road and waited for me to arrive. I almost barreled into him to give him a big bear hug, but that might have been weird. I guess I was just feeling particularly lonely. Russ and I talked for a short while, mostly griping about flats, but all too soon he wanted to keep going. He assured me that I was heading in the right direction to see more cyclists soon. And actually, I saw a couple more cyclists later that day! As I was eating lunch, I saw a couple guys roll past on their loaded bikes, and I got up to catch their attention, but by the time I got to the sidewalk they had disappeared. So I finished eating then went on my way. But then I saw them again in Richfield, stopped at the side of the road looking at their phones. I pulled up and they looked like they had been expecting me. “There you are!” they said. “We’d been wondering where you were.” Turns out they had also bumped into Russ after I had, so they were looking out for me, and just as I caught a glimpse of them as they rolled past, they had caught a glimpse of me. We griped about flats some more, and I couldn’t help but notice that they actually carry a floor pump with them! They’d been having so many flats it was worth it to them to buy and carry around a floor pump. I’d been nearing that point! Then we also agreed that we are not real cyclists, and as if on cue, we all lifted the edge of our shorts to reveal the hidden spandex. I had been suspecting that the touring cyclists are a different breed. Mostly we don’t seem to consider ourselves cyclists, and I think for many of us a distinguishing feature is the hidden spandex. These two guys told me they were staying at a motel in Richfield, but I wanted to keep going. There were still a few hours of daylight left, and I told them I wouldn’t know what to do with myself if I stopped. They gaped at me. “Drink!” they said. It was tempting, but I pushed on, even though I didn’t see a place to stop until the Big Rock Candy Mountain Resort, another 25 miles away. Well, it was worth a shot, I figured, and on I went. Turns out the resort was too far away. I got really tired and really hungry and thought about stealth camping, but there was barbed wire all along the road blocking access to good camping areas. But Google doesn’t know all! Even though it wasn’t on Google Maps, I was saved by the sudden appearance of a campground in Joseph. So instead of plunging along into the deepening darkness, I got a campsite and took a shower. The nice part was that I was on a very lovely bike path. Tuesday morning I couldn’t have asked for a better start to the day. I had my own personal bike path and the headwind I’d been battling since leaving SLC hadn’t kicked up yet. A paved bike path with wonderful views, all to myself. I was so blissed out, riding along looking at my surroundings, not in the least worried about traffic or wires on the road or any of those usual pesky things, that I didn’t see the gorgeous glittering green snake until it was too late. I heard myself gasp in horror, but the deed was done. I couldn’t bring myself to turn around and check on it – what would be the point? I see a lot of roadkill, and sometimes I’ll stop to admire it if it’s not too stinky, maybe even take a picture of it – but I had no interest in adding to it. Cyclists are supposed to be better than that. Not a day has gone by since that I don’t think about that green jewel of a snake. It’s always humbling when someone thanks me for helping their cause. I only wish I could do more. But then something comes along and reminds you that your worries are pretty small compared to others’. While stealing ice from a gas station, I met a man who shared quite a bit of his life story with me once he learned that I was doing my ride for blood cancer. He was in town to tie up affairs with the recent passing of his mother, and many members of his family either are or had been battling cancer. It was humbling to listen to all the trials they’ve been through. He thanked me for my efforts and placed my sticker on his truck. It’s an unusual mixture of feelings I experience when people open up to me so much during our brief encounters. Maybe someday I’ll find the right word for it. 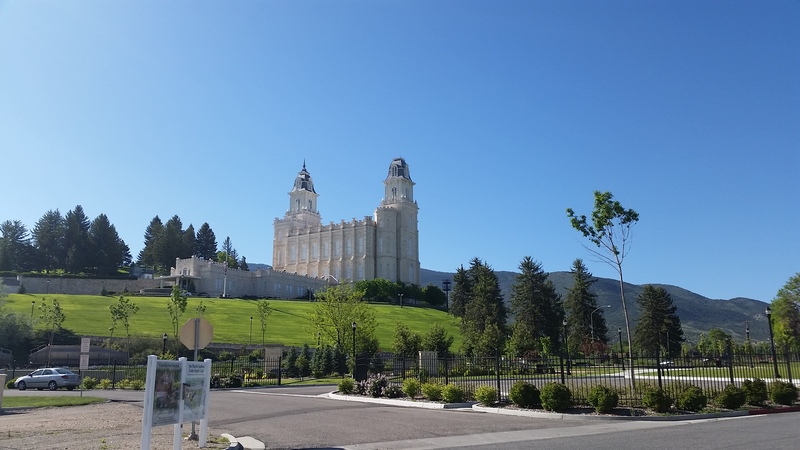 Towns of the Mormon pioneers. This man also told me a joke he had heard about the wind, since I was back to battling it in my usual way. 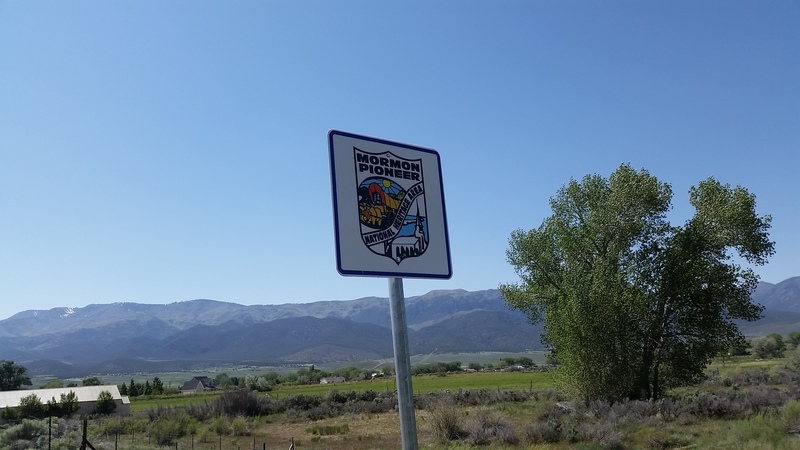 Everywhere around here there are towns that are proudly advertised as founded by Mormon pioneers. He said that as the Mormons were making their way south, they decided to take a break and would continue once the wind died down. And that explains why their towns are still here today. It’s funny in a tragic kind of way for an idiot who once rode her bike The Wrong Way up the coast and is now going The Other Wrong Way down Utah. 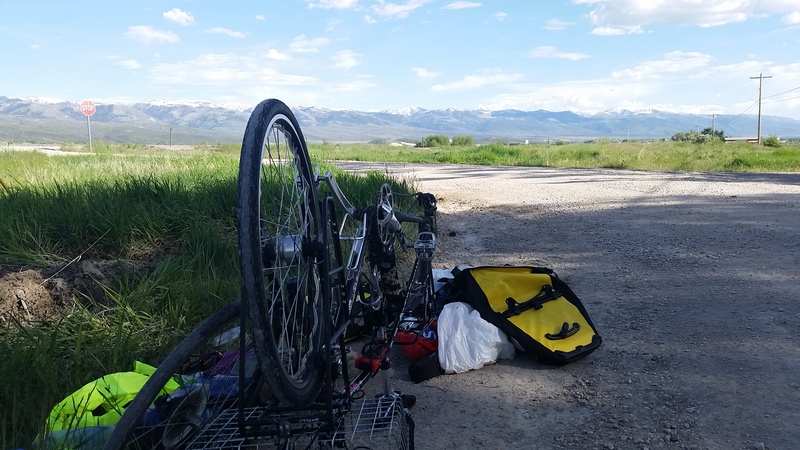 That night I camped in Panguitch, and as I was setting up my tent a nice lady came up to me and said that she had seen me earlier in the day on the road. She looked incredibly worried about me, but she also looked like she was trying to be happy for me. “You must have incredible stamina,” she said. Stamina… I like that word. I usually call myself stubborn, but maybe I should say I have stamina. Then she pressed a five dollar bill in my hand and told me to eat something. So I did. 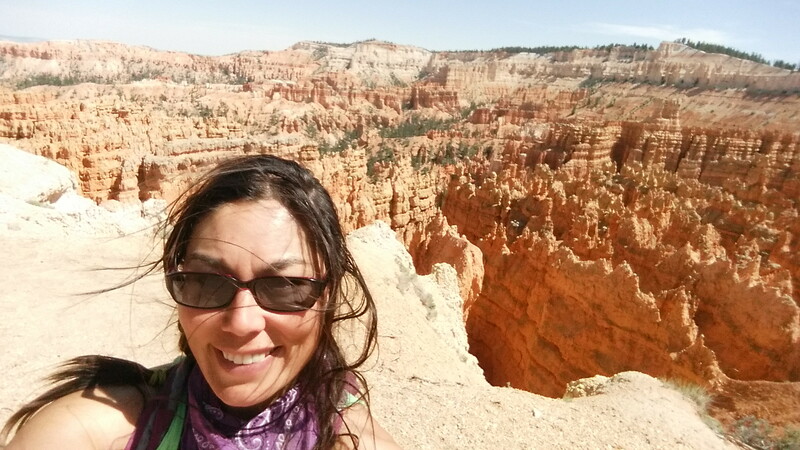 Wednesday I was getting so close to Bryce Canyon, I couldn’t stand it. Part of me wanted to get in there, part of me wanted to savor the experience. I felt like I was on the brink of a once-in-a-lifetime event, and I didn’t want to rush it. Getting so close! Savor it! Approaching Bryce Canyon you can see the reds and pinks of the mountains, promising incredible views. I knew it would be fantastic. I just didn’t know how fantastic. First I entered Red Canyon. And pretty much decided right away that I didn’t need to go anywhere else. I hiked around a little bit, but then figured that I couldn’t really improve on the spot where I parked my bike. So I hung up my hammock and read my Stephen King book while I waited for a lecture by a paleontologist to begin at the campground. I couldn’t wait to hear more about the geological formations that surrounded me, and I was not disappointed. 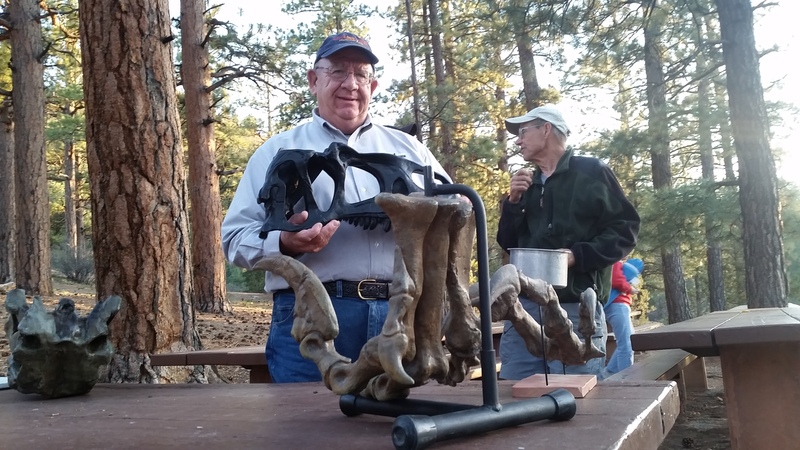 He was such a great story teller and had all kinds of fossils to pass around. I was the annoying one in the group who kept asking questions. That night I was going to camp somewhere off in the park where the rangers told me it would be okay to do so, but I got invited by a couple, Chip and Bernadette, to share their campsite. Of course I accepted, and they fed me homemade cookies and brownies. Chip runs ultra marathons at the age of 60-something, and they were there for this 100 mile race in Bryce Canyon. He says he can do the 100 miles, he’s just never finished a race within the time limit. He was trying now for like the twentieth time to finish in time. I’ll have to write to him to find out if he met his goal. Anyway, it was great that I was able to meet them and chat with them, if for no other reason than because it explained all the wiry people I was seeing everywhere. I was beginning to suspect it was just the effect of the dry desert air. 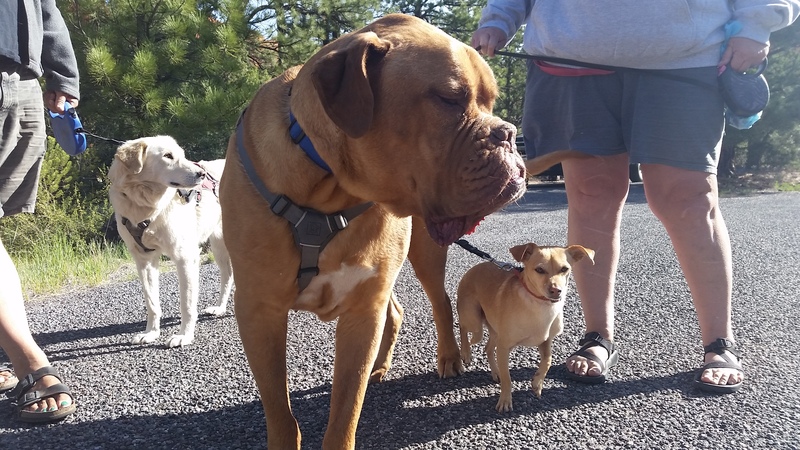 Service dogs that work with the elderly and autistic children. 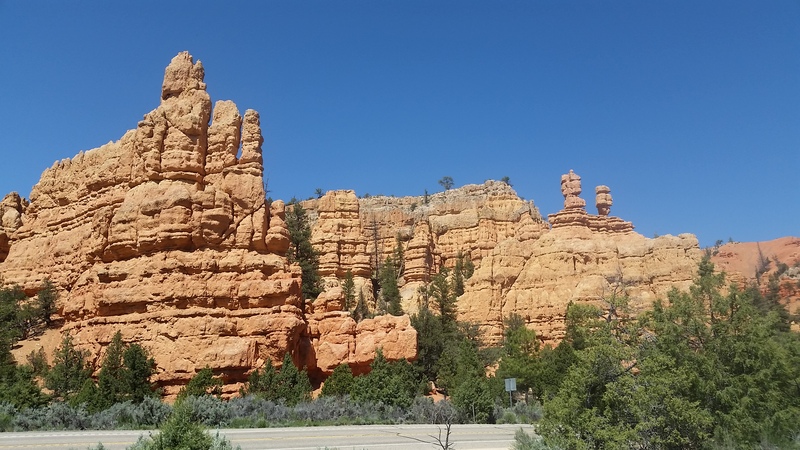 Thursday I slowly worked my way through Red Canyon, stopping of course to admire some excellent service dogs, and continued on to Bryce Canyon. 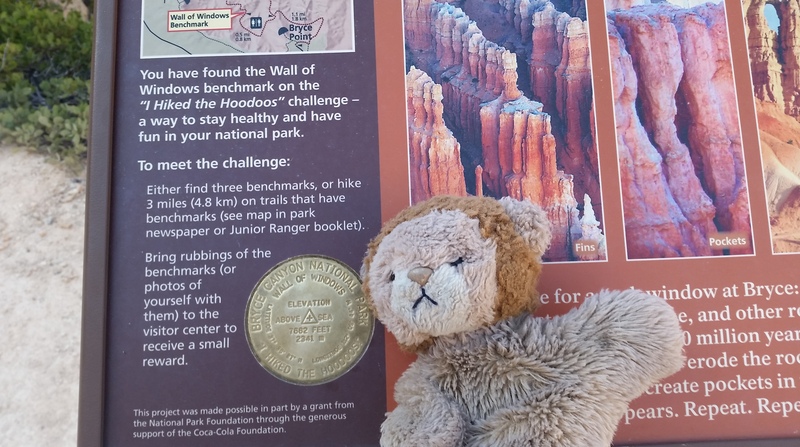 I didn’t think that Bryce Canyon could improve on Red Canyon, but I nearly fell over when I approached the rim and looked down. I’ve seen pictures. Everyone’s seen pictures. But nothing compares to actually being there. I really have nothing to say, other than go see it. Lutz wasn’t allowed on the trails, but I snuck him on the Rim Trail for one quick photo. An ultra marathon runner on a practice run snapped this photo for me. 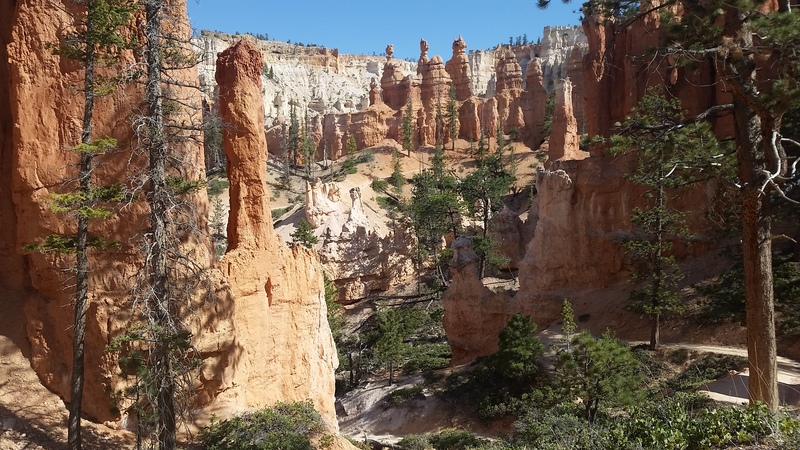 I took myself for what promised to be about a mile hike on the Navajo Loop, but it connected with the Peekaboo Trail, so I continued on that, then continued on to Bryce Point from there. When I climbed back up out of the canyon I found out I’d walked through almost the entire section that has the most popular views. So I got onto the Rim Trail to walk back to where I’d started. By that point it was late, so I got on my bike and took myself out to dinner. I made the mistake of going for the buffet. I thought I would be able to handle a feast. But I think my body is now so used to always being hungry, it didn’t know how to deal with being full. I whimpered all night in my tent with a tummy ache. This picture does not do Bryce Canyon justice in any way. Very disappointed. In fact, this is almost criminal. We saw one of these things and Mr. Lion said he didn’t care for getting a reward. But at the second one he did. He wanted me to walk back to the first one. I told him forget it. 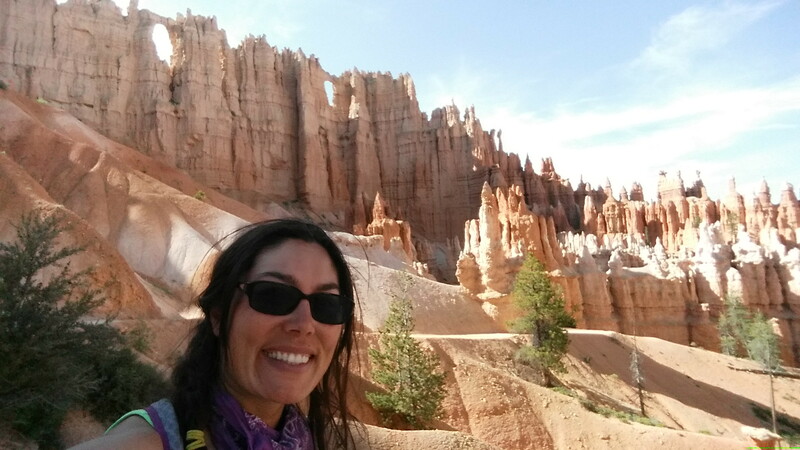 You can’t appreciate the size of the hoodoos til you’re standing next to them. Friday I thought that I might go back and do another hike in the morning, but I woke up to rain. And since I slept poorly, I thought I’d just take advantage of the campground’s WiFi for a little while and charge up my appliances until the weather got a little better. But instead it started to hail. I called my Mom to whine and fuss because I had managed to trap myself under the eaves of the bathroom and had nothing else to do. When there was a break in the weather, I quickly packed up and decided to make a break for Zion. I was worried about my schedule and wanted to get some miles in. But pretty soon the wind kicked up again, the thunderclouds moved in, the rain came in a torrential downpour, and then there was more hail. I ducked into a little store and waited for it to pass, but a half hour later it was still going strong. There was a motel nearby and everyone at the store, including the owner, wouldn’t stop worrying about me until I said I would check in at the motel. All they had left were cabins, so I stayed in one of the adorable cushy cabins, and once I got settled down the weather cleared. Of course. I was enormously crabby about it, but it gave me a chance to catch up on my blog. Which I’m perpetually behind on, I know. Give me a break, it’s hard to keep up! Buffalo! On the other side of a fence, which is good. 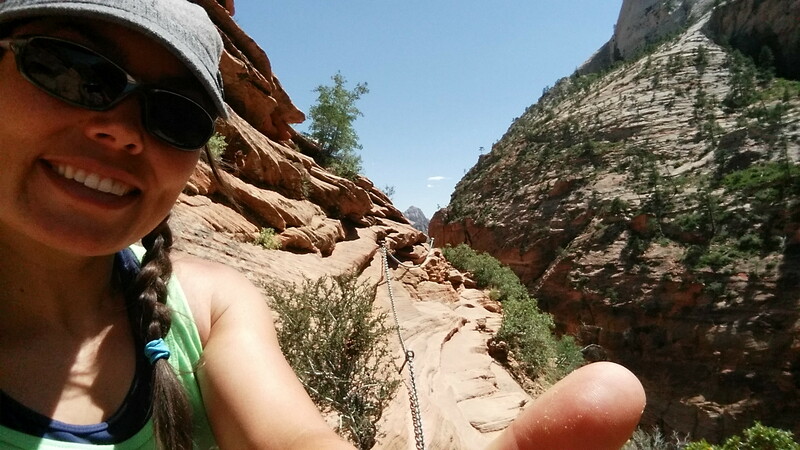 On Saturday I was able to almost make my way to Zion. 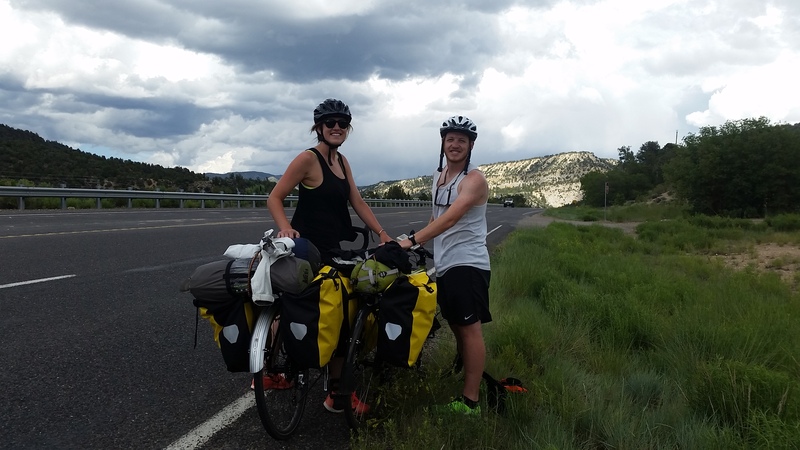 I met a couple more cyclists just leaving Zion. They agree, it’s very difficult to blog from the road. I stopped at the campground just outside the park, very happy with an incredible accomplishment I managed that day. 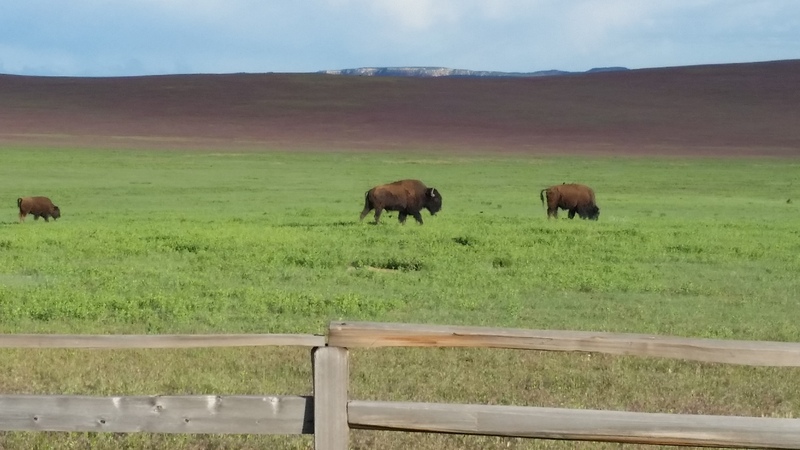 There is a buffalo range there, and it’s amazing to see the buffalo herds wandering around their pastures, maybe looking a tiny bit like they used to years ago. After stopping to admire them and snap a few pictures, I got back on my bike and got to coast at a good clip downhill. And I caught up with a line of buffalo that were also running down the hill! So I got to ride alongside a line of running buffalo, which was an amazing experience, enjoyable I’m sure largely because of the fence separating us. My friend Tucker once told me about how she got to swim in the ocean with newly hatched baby turtles, and I thought that surely, with an experience like that, I could die happy. Well, I think being able to ride a bike alongside running buffalo might also qualify. 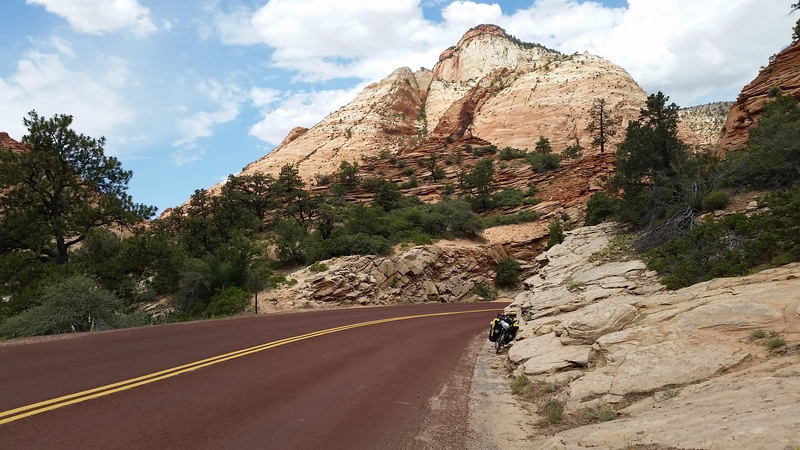 But then again, can riding alongside buffalo in a pasture really compare to what I did on Sunday, which was to ride through Zion, all downhill? I thought Bryce Canyon had taken my breath away and I had nothing left to give, but Zion took it too. What can I possibly say? My pictures don’t do justice. But here are a few anyway. Lutz resting by the side of the road. 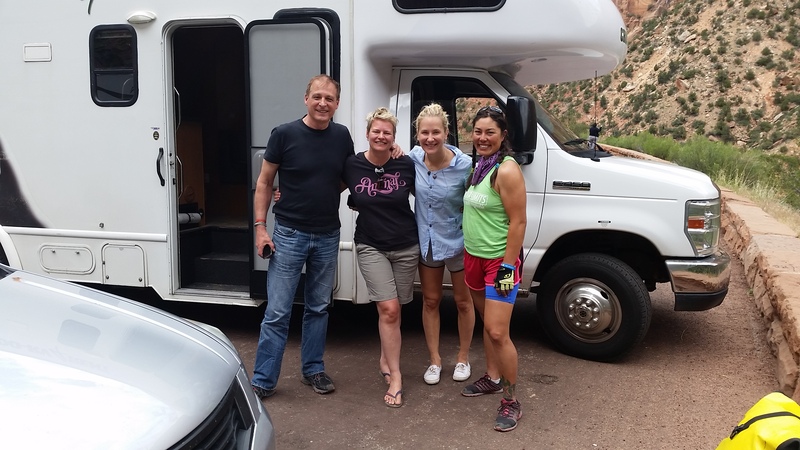 These nice people gave me and Lutz a ride in their RV through the tunnel where you’re not allowed to ride a bike. 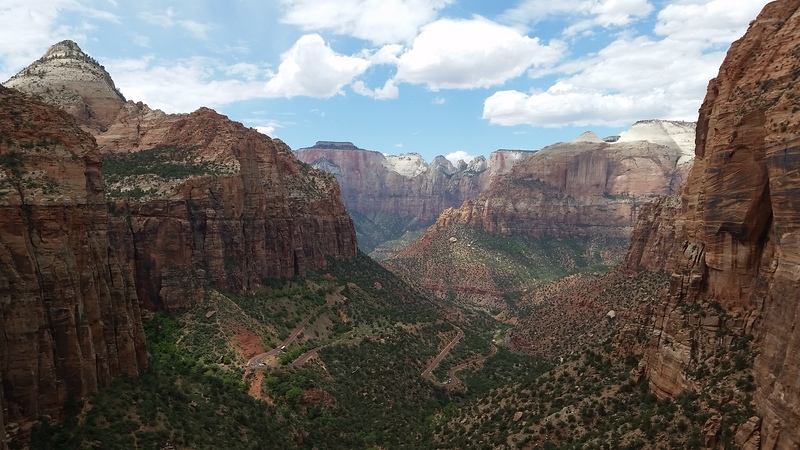 I seriously need to do a better job of researching places before I visit, because it wasn’t until I got to the very end of what I thought was my time in Zion that I discovered the main attraction. Zion Canyon branches off the road and you can’t drive on it without a red permit, and I didn’t know if that included bikes. 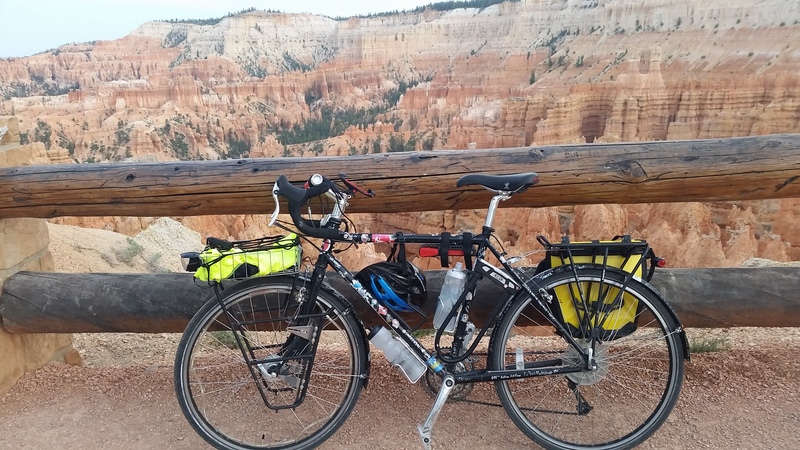 So I stopped and wondered if I could explore this canyon, and the driver of the shuttle that was going by jumped out and immediately insisted that I throw my bike onto the bike rack, and he said he’d drive me up the canyon, then I could ride downhill back out. Well that sounded like a stroke of genius, so that’s what I did. I have to say thank you to him and all the other passengers on the shuttle for being so patient as we struggled my bike into the rack and strapped it down with bungee cords. It was the end of the day by then, and I could only do a quick hike before heading to the campground in the park, and I knew that I had to go back. The campground was full, but I figured I could find a nice person willing to share a site with me. And I did! Steve was destined to be my new buddy, even though he was planning on starting his solo spirit journey that day. But I wormed my way into his campsite and into his cooler of beer and whiskey. He didn’t seem to mind. Me and my new buddy Steve sharing a day of hiking. Odd to think how much power that little river can have as it sculpts these walls. 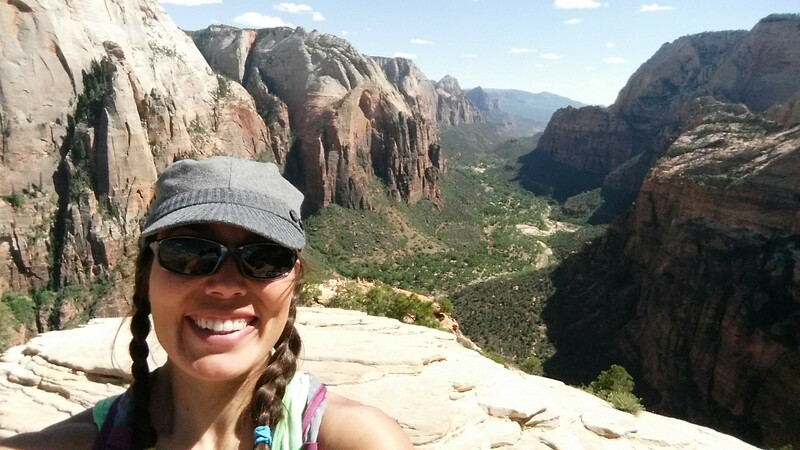 On top of Angels Landing. 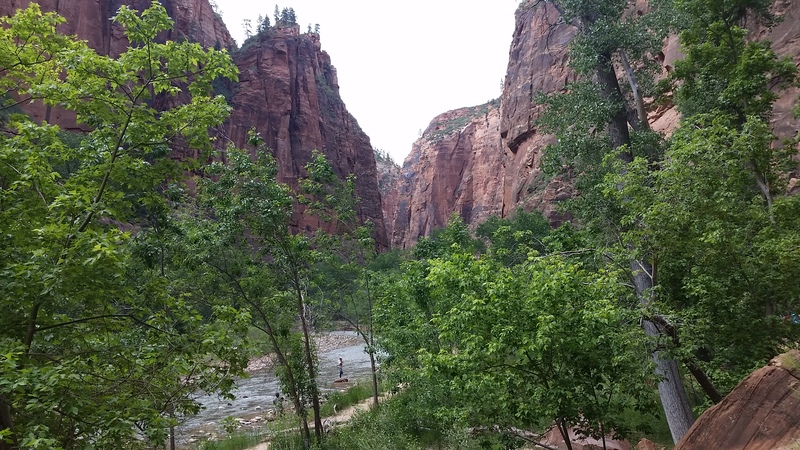 The next day, Monday, Steve and I rode the shuttle back into Zion Canyon and hiked to the Emerald Pools and up to Angels Landing, a spot so high that it was said only angels could land there. It was a challenging hike, much of it assisted by chains anchored into the cliffs. And this is why I subtitle this post as Seven. There are signs warning people that six people have fallen to their deaths on this hike since 2004. And honestly, Steve and I are surprised it’s not more. We were both astonished that we could live in a country where you have to put warning labels on cups of coffee, but you can still be allowed to clamber up to this high point of rock with just a few chains to assist you. So we joked about all the times when we thought we were going to fall to our deaths, and what we would say during the long descent. Steve said he thought about shouting that he was sorry that they would have to update their sign now. I figured I would just shout, “Seven!! 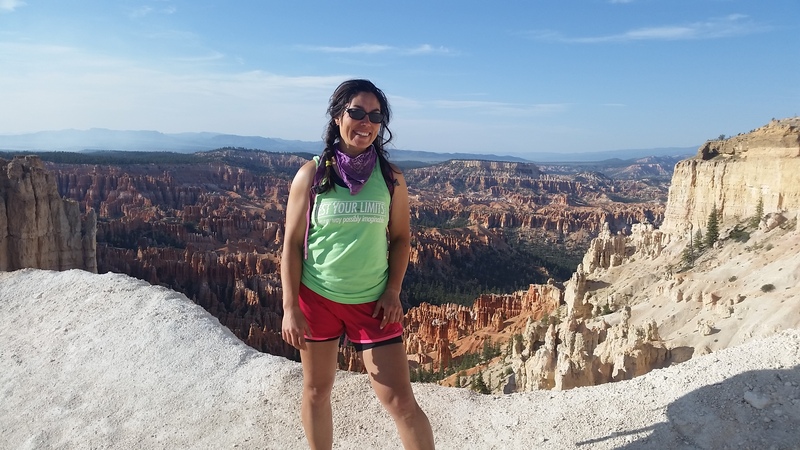 !” To me, that word combines so many of the feelings I had during this portion of my journey – the awe, the thrill, the twinge of fear, the humor, and the reflection I kept experiencing on our short time on Earth while these canyons reflect the eons that go by. I thought this might well be my last photo, right before attempting to walk along this cliff with the help of a chain. Steve on a cliff with some handy chains. Tuesday morning I had to say goodbye to Steve and make my way to Cedar City. 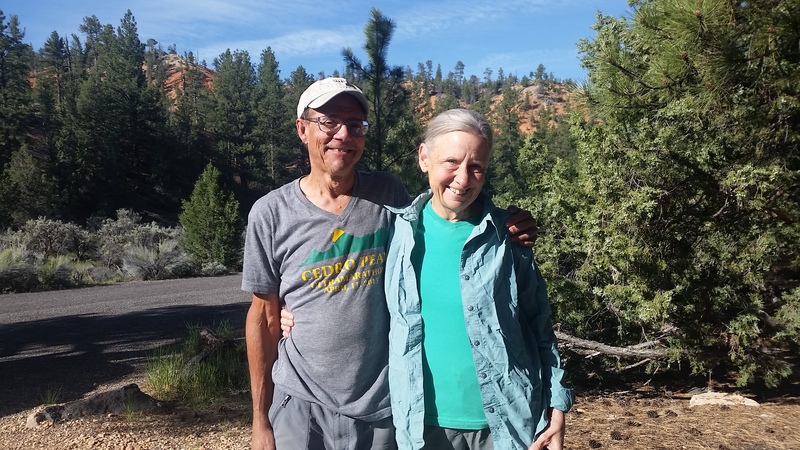 I was going to Cedar City to see my Cousin Kathy, whom I hadn’t seen in years – I don’t think since Cindy’s wedding in 1995! And her two kids, Kyle and Matthew! Cedar City was also where I would get onto the Western Express route and start making some serious progress east. 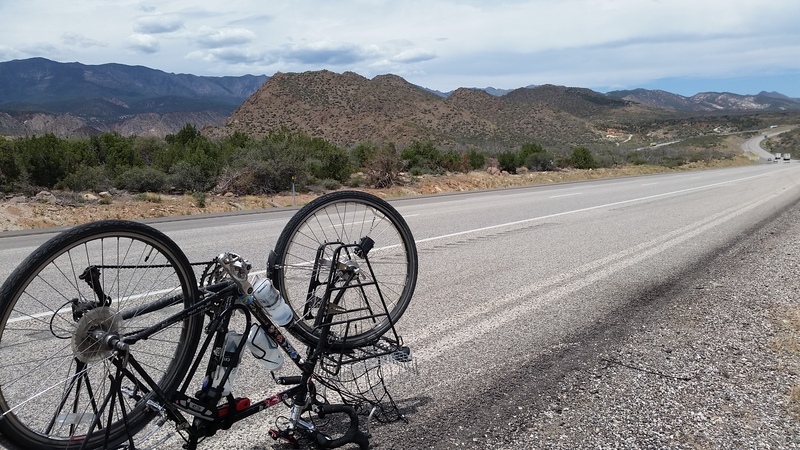 I was concerned about my route to Cedar City, though, since Google Maps insisted on keeping me far away from I-15 and was putting me on dirt roads with lots of climbing. I asked the rangers at Zion about it, and they told me to stay on I-15 since the dirt roads were impassable and still covered in snow. Well, that made the travel easier, except for the flat I got within two minutes of setting wheel on the interstate. Darn wires. Another victim of interstate riding. 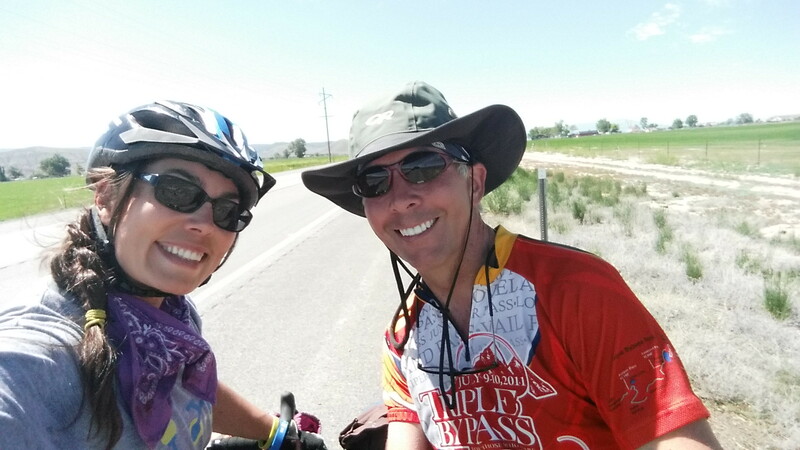 But I made it to Cedar City, and Cousin Kathy was out on her bike and she met me on the road! We rode back to her house together and she shooed me into the shower, which I was very grateful for – I hadn’t showered in days and was covered in bike grease from all the flats I had to deal with. Her boys, the sweetest college youths you could ask for, fired up the grill, and we had burgers and hot dogs for dinner while we got caught up. Then we piled into the car and got ice cream. Wednesday morning I took my time getting ready, wanting to spend some time with my cousins and enjoying the company until I had to get to chipping away at the Western Express route, which promised to be very challenging. 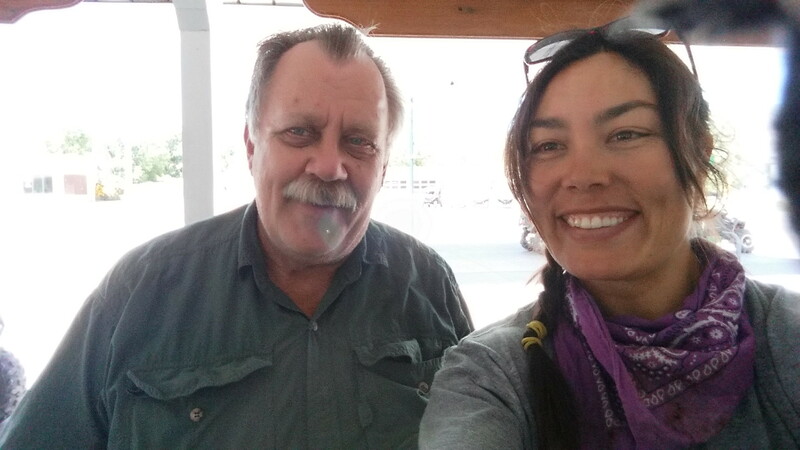 Sadly, I could not stay any longer past noon, as I had to get to either Cortez or Dolores, Colorado, in time to meet my friend James. But that’s for the next blog post. 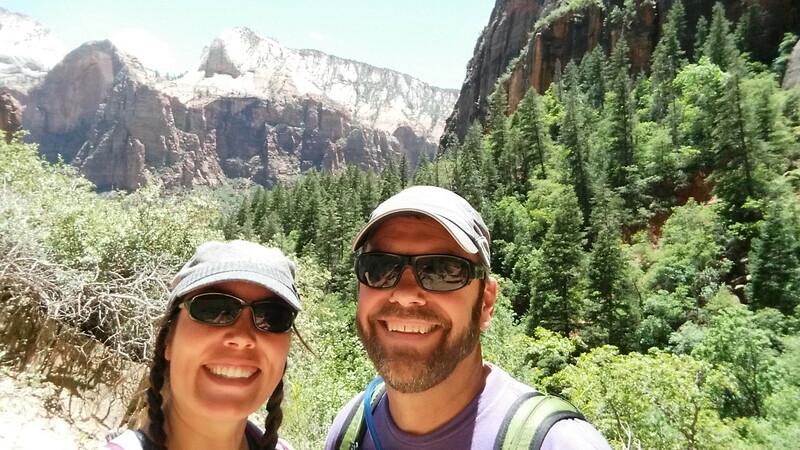 This entry was posted in Camping, Cross Country, Friends and tagged Angels Landing, bikes, Bryce Canyon National Park, Buffalo, Camping, Cedar City, hiking, paleontologist, touring, ultra marathon, Western Express Route, Zion Nation Park by surlygiver. Bookmark the permalink. 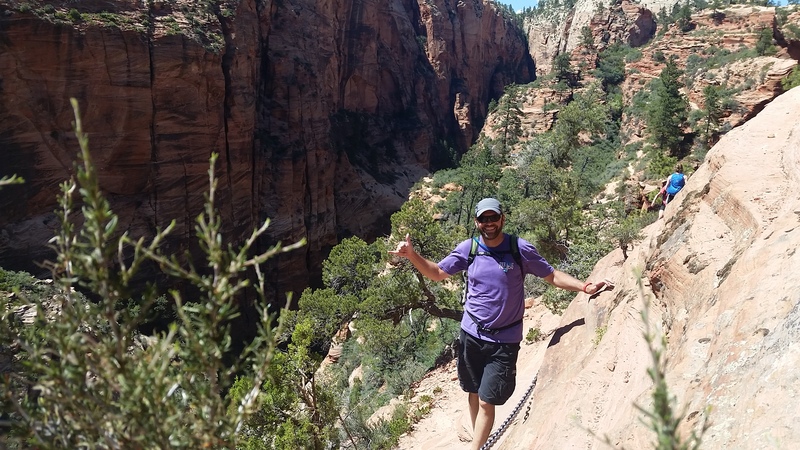 Yeah – Bryce and Zion were destined to be highlights of this trip from this trip and will be remembered long after the wind and hailstorms are forgotten :). And better yet are all these fantastic chance meetings of amazing people sharing their beer and cold sodas, their $5 and their personal stories. So awesome. Dude! I was updating the PC site. Why wasn’t there a BBB link on there? Fixed now! 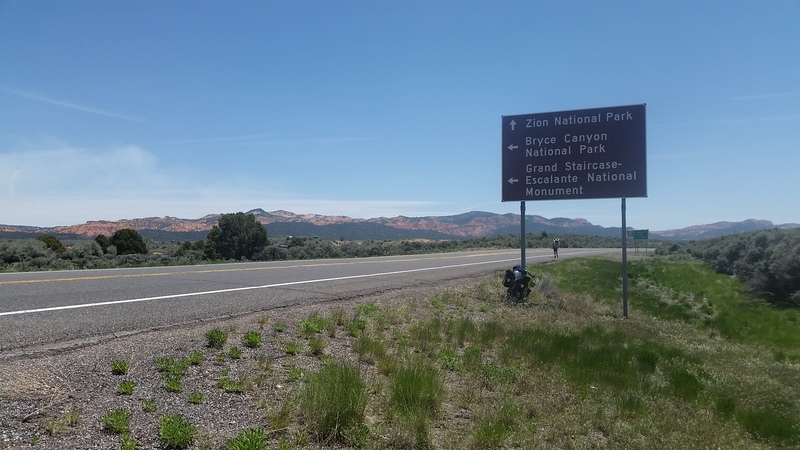 Do you have a GPS track or can you outline the route you took from SLC to Cedar City? Great blog!